On Tuesday, the Brewster County Groundwater Conservation District denied a water well permit application filed by Pumpco, Inc. – the contractor preparing to build the Trans-Pecos Pipeline. 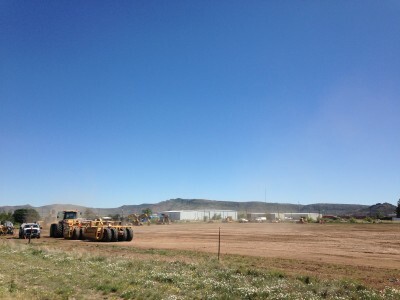 The company’s been clearing a site in Alpine that will be used to stage the pipeline for construction. The denied permit comes a few weeks after a district board member, Tom Beard, was arrested for trespassing and felony assault during an altercation with a Brewster County Sheriff’s Deputy at the Alpine site. Reports said Beard was there to find out whether or not Pumpco had a permit for a water well it was already using. District Manager Conrad Arriola later confirmed the company did not. “It was the wrong acreage on the land, and the production was above our allowable production, so the board voted not to approve it,” he said. Arriola said Pumpco has already re-applied for a permit, and the board will likely hold another public hearing on that application later this month. It’s not clear whether this means Pumpco will stop using water at the Alpine site, given that the company was already pumping without a permit, and the groundwater district didn’t previously take enforcement action against the company. Arriola said Tuesday the district had not instructed Pumpco to stop pumping from the well, though the company has indicated it will abide by the district’s rules. “According to our rules, they are not allowed to do it, and they understand that,” he said. Still, Arriola could not confirm whether or not the company is still using water from the site. “You’d have to ask them if they were still pumping,” he said. A call to Pumpco was not returned this week. Arriola said if the company continues using the water well in question without a permit, it would be up to the district board to enforce the rules. Meanwhile, Tom Beard’s trespassing and felony assault case is still pending. “He may end up going District Judge [Roy] Ferguson,” Brewster County Judge Eleazar Cano said Monday. This entry was posted in KRTS News and tagged alpine, Brewster County Groundwater District, Energy, Inc., Industry, Infrastructure, Natural Gas, Pumpco, Tom Beard, Trans Pecos Pipeline. Bookmark the permalink.